Waiting in a corner of the spirit collection area were two fork-lift pallet loads of long-neglected rodent specimens. Most had been collected by members of the former Ecology Division DSIR and New Zealand Wildlife Service. They had been donated to the National Museum during the massive government service restructurings of the late 1980s that resulted in the creation of successor agencies Landcare Research and the Department of Conservation. Despite the turmoil of restructuring and job losses, both the Department of Conservation and Landcare Research embarked on two decades of developing huge advances in pest eradication techniques. Most notable were developments in the application and use of anticoagulant baits to eradicate four species of introduced rodents from ever larger islands. As an unexpected consequence, those two unloved and nearly forgotten pallet loads of festering and desiccating specimens contained many examples of rodent populations that are now extinct. Between 1987 and 2007, kiore (Pacific rats), Norway rats, ship rats and house mice were eradicated from over 90 islands around New Zealand, ranging in size up to 11,300 hectare Campbell Island. Examples of rats and mice from many of these islands were in jars on those two pallets, but until they were catalogued and entered into Te Papa’s electronic database, there was no easy way to determine which of the extirpated rodent populations were represented in the national collection. 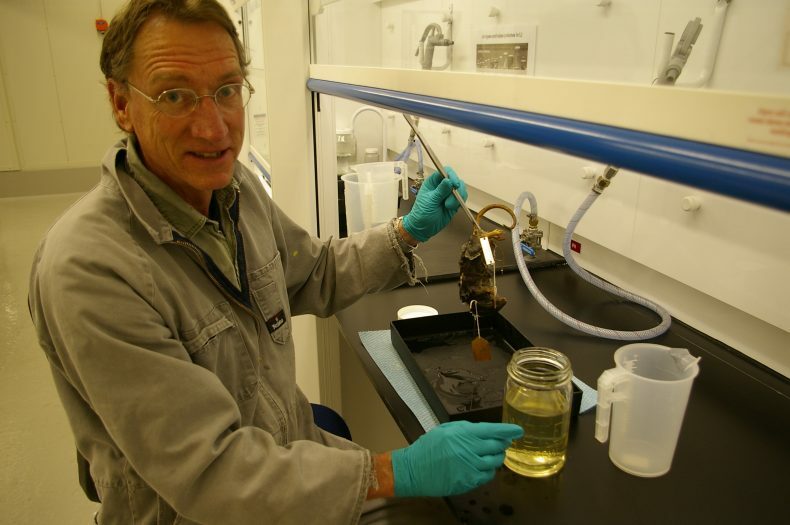 With the help of Natural Environment collection technician Tom Schultz over the last 4 months, all the samples have been sorted, and decisions made on which to keep as spirit specimens versus prepared as skeletons versus sent to the landfill. All 664 spirit specimens that we chose to keep have been labelled, placed in jars of ethanol in the spirit collection, and all their data entered in the EMu electronic database. Kiore (Pacific rat) Rattus exulans: Kermadec Is (Raoul & Macauley), Moturua I. (Bay of Islands), Lady Alice I. (Chicken Is), Taranga (Hen I. – eradication yet to be confirmed), Mokohinau Is (Burgess I., Trig I., Stacks C, D & F), Tiritiri Matangi I., Little Barrier I., Cuvier I., Mercury Is (Red Mercury, Stanley, Double & Korapuki Is), Ohena I., Middle Chain I. (Aldermen Is), Mayor I. (Tuhua), Rurima Rocks, Kapiti I., Long I. & Motuara I. (Queen Charlotte Sound), Centre Island (Foveaux Strait), Codfish I. (Whenua Hou), and Putauhinu I.
Norway rat Rattus norvegicus: Raoul I., Bay of Islands (Motukiekie, Moturua, Okahu, Urupukapuka & Waewaetorea Is), Motutapu I., Whale I. (Moutohora), Breaksea I. (Fiordland), and Campbell I. Ship rat Rattus rattus: Rangitoto I., Big South Cape I. (Taukihepa), and Macquarie I. (eradication yet to be confirmed for latter). House mouse Mus musculus: Allports I. (Queen Charlotte Sound), Enderby I. (Auckland Is), and Macquarie I. (eradication yet to be confirmed for latter). Doing a little research into our native fauna, but the title for this caught my eye. Interesting job you have. how cool dissecting 30 year old rats! !